On 15 December 2016, the Act Promoting Implementation of Specified Integrated Resort Areas (the Act) was enacted in the Japanese Diet session with an aim to legalise gambling to be operated by private entities in Japan, which is the latest development in a long-standing debate on whether to legalise and permit casinos in designated areas of the country. Licences are required to operate these forms of gambling activities, which under the current legislation, have been granted only to local governments or government-related entities. In this context, Article 185 of the Penal Code provides that a person who gambles shall be punished by a fine or a petty fine of not more than ¥500,000, unless the item that is placed on the bet is that of momentary amusement. The term ‘gamble’ is understood as ‘an act where more than two persons bet on an outcome of a contest of chance to contend for a prize in the form of property or asset’ (Tokyo High Court, 28 November 2006). The ‘outcome of a contest of chance’ means an outcome that is something unpredictable or out of the contestants’ control. The Old Supreme Court case of 13 November 1911 found that if the outcome of a contest depends upon an element of chance to any degree, the outcome shall fall under the ‘outcome of a contest of chance’, even if such outcome depends on certain skills of the contestants (except when the outcome is evident in advance on the basis of any gap between the contestants’ skills). Accordingly, Japanese court precedents have found that the outcomes of games of ‘igo’ (Old Supreme Court case of 10 June 1915), mah-jong (Old Supreme Court case of 28 March 1935) and Japanese chess (shogi) (Old Supreme Court case of 21 September 1937) all fall under the category of ‘outcome of a contest of chance’. To ‘bet to contend for a prize in the form of property or asset’ means the winner wins and the loser loses a prize in the form of property or asset. If one of the contestants does not lose any property, that is, he or she has no risk of losing his or her property, the contestants are not contending for a prize in the form of property or asset (Old Supreme Court case of 30 April 1917 et al). Article 186 Section 2 of the Penal Code further prescribes that a person who, for the purpose of profit, runs a place for gambling or organises a group of habitual gamblers shall be punished by imprisonment not less than three months but not more than five years. The term ‘running a place for gambling’ is understood to mean providing, as a host, a certain place for gambling that is under the host’s control (Supreme Court Case of 14 September 1950). In this context, ‘certain place for gambling’ is understood to mean that a physical location or actual gathering of the players to such location is not required (Supreme Court case of 28 February 1973). The crime of running a place for gambling also requires running a place for gambling and ‘obtaining profit’ (Article 186, Paragraph 2) and the term ‘obtain profit’ is understood to mean having the intention of obtaining illegal financial benefit (in the form of fees, commissions or others) in consideration. The Penal Code has a certain carve-out stating that gambling will not constitute a violation of the Penal Code, if the ‘item which is placed on bet is that of momentary amusement’. This term is understood to be something of very low value that will not unduly stimulate a person’s passion for gambling. The Supreme Court of Japan, however, has found that cash does not, regardless of its amount, fall under the definition of ‘momentary entertainment’. 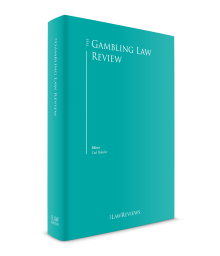 Thus, gambling that is legally permitted under the current Japanese law is limited to gambling facilitated by licensed public entities, and interpretations of gaming and gambling regulations to date have been consistent with this general rule. For example, in September 2005, the Osaka District Court found the Japanese operators of a website offering gambling services regarding baseball game results guilty and sentenced them to suspended jail terms. There is no court precedent in which the operator of an offshore online gaming service provider was convicted of violating the prohibition of gambling. However, on 1 November 2013, a deliberation concerning the legality of online gambling was conducted in the Japanese Diet and, upon such deliberation, the government presented its view concerning online gambling, which is that participating in online gambling operated outside Japan through the internet from Japan (or participating in casinos outside Japan airing live through the internet from Japan) will constitute gambling in Japan if a part of such gambling was conducted within Japan, such as participating through the internet from one’s home in Japan (i.e., the person in Japan was not physically present at the gambling house overseas). Accordingly, in 2016 there was a case where several players located in Japan who were playing an online gambling game distributed by an offshore online gaming service provider (Smart Live Casino) through a server located outside of Japan (United Kingdom) were convicted of illegal gambling. In this case, it was reported that the relevant gambling website had descriptions written in Japanese since September 2014 and was open from early evening to after midnight Japan time and, in addition to that, the dealer was Japanese and the users were able to talk with the dealer in Japanese. It is considered that these factors formed the grounds for the website to be considered as providing services that were targeted to Japanese people. It should be noted, however, that this case was dealt with under the summary proceedings, which are not a formal trial at a summary court. A trial in these proceedings takes place only with an examination of documents submitted (no public trial including witness examination takes place) while parties are not present. Therefore, it is unclear whether the court would come to the same conclusion in a formal trial. With regard to operators not located in Japan (not necessarily being the operators of online gaming services) but that have a connection to Japan, there have been two cases to date that are relevant to the issue of liability of a foreign company: the first one was against Manning in 1992, and the second was against SSP in 1996. Manning, a UK bookmaker, appointed a booking agent in Japan whose role was to act as a liaison, accepting and relaying bets to Manning in the UK (or otherwise outside Japan). The National Police Agency (the agency that formulates police systems and undertakes the administration of matters that form the foundation of police activities, and also conducts police operations regarding cases involving national public safety) gave an oral warning to the booking agent to the effect that even if bookmaking took place outside Japan, customers in Japan would be punished for gambling along with the booking agent for the crime of habitual gambling. The National Police Agency further warned that if the booking agent accepted any funds in Japan from customers it would commence a criminal investigation. SSP was also a UK booking agent. According to a press report, SSP operated a website directed at Japanese residents whereby they could place bets via the internet, with all funds transferred through bank accounts located in the UK. The National Police Agency stated that even if the solicitation was made over the internet, the offer to accept bets made by the bookmaker via the internet to residents of Japan would be deemed to constitute an offer made in Japan. In this case, SSP had no presence in Japan, and to the best of our knowledge no action was taken against customers who placed bets with SSP. Although the Manning and SSP cases were not tried in court, they demonstrate a certain willingness (which is quite rare) of the National Police Agency to investigate gambling activities occurring in Japan involving a foreign company or individual. In light of the general prohibition on gambling, official discussions on whether to legalise casinos in Japan have been taking place for some time now, dating back to 2006 when the Liberal Democratic Party (LDP) produced a report entitled ‘Japan’s Basic Policy concerning the Introduction of Casino Entertainment’. These discussions have continued since then, and in 2013, the LDP and certain other members of a cross-party group called the ‘Alliance for the Promotion of International Tourism’ (the Alliance), including as its members Shinzo Abe, the current Japanese Prime Minister, and Taro Aso, the current Treasurer and former Prime Minister, submitted the bill to legalise casinos to the Japanese Diet, which was subsequently passed at the Japanese Diet session on 15 December 2016. The Act aims to carry out a two-stage legislative process by (1) passing an act to facilitate the development of integrated resorts and (2) passing subsequent acts to actually implement integrated resorts. Since the Act focuses only on facilitating the development of integrated resorts, it contains only 23 articles, which describe the basic policy and the process for the introduction of casinos in Japan. Thus, the passage of various subsequent series of bills will be necessary in order to actually legalise the operation of casinos in Japan. Subsection ii, infra, gives a brief explanation of the Act’s key points. [t]he implementation of the Specified Integrated Resort Areas shall be promoted on the basis of achieving international competitiveness and attractive extended stay sight-seeing visits. As indicated above, Articles 1 and 3 illustrate that the Act in its current form is only contemplating legalising casinos that people physically visit, thereby promoting tourism, and is not necessarily aiming to legalise online casinos. In response to the passage of the Act, an official discussion has started at a cabinet meeting to establish a consolidated measure to address gambling and gaming addiction in general, which not only addresses gambling (i.e., casinos, lotteries and public sports) but also certain financial commodities (such as foreign exchange transactions), or pachinko and other gaming. Therefore, it is possible that during the course of the discussion to address gambling and gaming addiction problems, further discussions may arise with regard to legalising online casinos through different legislation. Article 2.1 of the Act expressly provides that a specified integrated resort will have ‘casino facilities (limited to those established and operated in the Specified Integrated Resort Areas by private entities…), convention facilities, recreation facilities, exhibition facilities, lodging facilities and other facilities accepted to contribute to the promotion of tourism operated by a private entity’, thereby opening the doors for private entities to become casino operators. On the other hand, the Act expressly excludes public entities from establishing and operating casino facilities. The Act includes no provision restricting the operator to an entity incorporated in Japan; thus, it is possible that there may be foreign casino operators. In fact, Takeshi Iwaya, Secretary General of the Alliance, suggested that ‘since there should be no Japanese company that is actually operating a casino in Japan, the experience, knowledge and customer list [with respect to casino operations] of a foreign company is necessary’; therefore, foreign operators should be very much welcomed. Article 2.2 of the Act provides that a specified integrated resort area should be ‘an area certified by the competent minister as an area where a Specified Integrated Resort can be established, based on the application of the local government’. The wording in Article 2.2 indicates that there will be at least two layers of the selection process: (1) selection by the competent minister of the local government where the integrated resort would be established; and (2) selection by the local government of the operator to operate the casino. The Act is silent as to which selection procedure will precede the other (the Act is also silent as to which ministry will be in charge, since Article 11 of the Act provides that the ‘Casino Control Committee shall be established as an external organ of the Cabinet Office’, it is widely assumed that the head of the Cabinet Ofifice (i.e., the Prime Minister) would be the competent minister in question); however, it has been reported that the government has come to an agreement that, in principle, the selection of an operator by the local government will come first since the competent minister would not be able to select the local government where an integrated resort is to be established by the location alone, and without knowing the actual plans contained in the application of the local government. As such, an applicant operator must propose a plan that is appealing and attractive to the local government, so that the local government will prepare the application to be submitted to the competent minister adopting such plan. The local government’s application adopting the applicant operator’s plan must then be selected by the competent minister as the location that is appropriate to be designated as a specified integrated resort area. A frequently asked question is where the first location for integrated resorts will be; however, since there will be a selection process for the locations, while the mass media speculate and try to predict, the actual location will be chosen based on numerous factors including the politial conditions at the time. The Act is virtually silent regarding the selection criteria of the operators, but there are certain matters that can be surmised from the wording of the bill and the remarks made by the legislators and members of the Alliance. The Act provides first that the specified integrated resort areas shall be promoted ‘by taking advantage of regional characteristics and the innovation and vitality of the private sector’s ability to contribute to the development of the regional economies and redistribute to the community the proceeds of the healthy casino facilities’ (Article 3), and also that ‘[t]he government shall take necessary measures so that the Specified Integrated Resort Areas will have the features central to establishing genuine internationally competitive and attractive tourist destinations while utilising regional characteristics’ (Article 6). Additionally, Mr Iwaya has suggested that local governments should take the lead in the selection of the operators. Similarly, he stated that ‘it is important that the local government have a concrete idea of what kind of facility it wants to establish from the beginning and to select the best project/operator’. Based on these provisions in the Act and the remarks by Mr Iwaya, it can be surmised that a foreign operator considering whether to participate in the selection process needs to prepare a proposal that is appealing to the local government, not only from a financial perspective, but also from the perspective of understanding the regional characteristics and the needs of the community. Having to include this level of specificity in an application could be one of many cross-border difficulties that a potential foreign operator may face, since the regional characteristics and the needs of the community, especially in Japan, may be quite different from that in the operator’s own country and other regions of operations. Additionally, the needs of the community and regional characteristics in Japan are different between regions that qualify as an ‘urban-type’ integrated resort where the number of citizens and infrastructure are well established, compared to ‘suburban-type’ regions, which are tourist destinations for vacation purposes. [t]he government shall utilise the funds, management skills and technical skills of the private sector, and take other necessary measures so that the implementation of the Specified Integrated Resort Areas will strengthen the international competitiveness and stimulate other areas of the economy, such as by improving the country’s tourism industry and increasing job opportunities. Therefore, although there is no nationality requirement for a casino operator, a foreign operator applicant must prepare a proposal that is not only financially feasible, but that can also improve Japan’s tourism industry and increase job opportunities. In this context, Mr Iwaya has said that ‘in Japan, it is undesirable for a ‘Gulliver’ to disembark in our country’ and that his vision of how things should work is ‘a world-class operator jointly collaborating in a project with a first-section listed Japanese company’. Further, Mr Koichi Hagiuda, Deputy Chief Cabinet Secretary, mentioned earlier this year that he believes it to be essential that the applicant will form a joint venture, and will not allow an operator to ‘cherry-pick’ certain portions of the integrated resort. While it is extremely premature to reach any conclusions with respect to the implementation of the Act, these remarks indicate that a plan designed where a foreign operator applicant aims to operate an integrated resort independently may suffer certain disadvantages in the selection process (although it should not be totally impossible for the applicant to win the bid), and that a plan in which a foreign operator applicant collaberates with Japanese partners might be viewed more favourably in the selection process. This chapter makes clear that Japan is at a very early stage of discussion regarding the legalisation of casinos, and the Act is not sufficient to permit the operation of a casino, for the law itself states that the ‘necessary legislative measures for this purpose should be taken with the intent of doing so within one year after the enforcement of this act’ (Article 5). Therefore, various legislative measures need to take place to actually implement the establishment of integrated resorts. While the Act provides that these measures should take place within one year, and the government currently intends to submit the subsequent implementation bills to the Diet in the summer of 2017 with the aim to pass these bills by the end of the year, it is possible that debates on how to implement the law might delay such measures, particularly because the actual details and mechanisms for implementing the law, including the measures to be taken against gambling addiction problems, would be set forth in subsequent legislation and regulations, which at the time of writing are yet to be made public. 1 Hitoshi Ishihara is a partner at Anderson Mōri & Tomotsune.